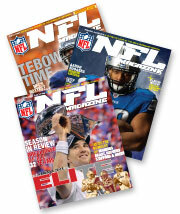 Sign up to receive the new NFL Magazine, the official magazine of the National Football League. Go deep with your favorite teams and players, and get the real insider story. The evolution of the tight end position is reshaping the pro passing game. Meet the new batch. RGIII: Better than Andrew Luck. Virtually.